The Flight of Fancy Bracelet is an easy bracelet to make and is great to wear everyday. 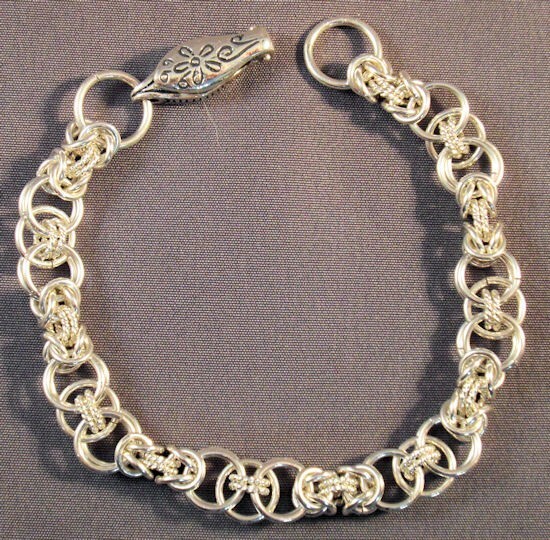 This bracelet combines two classic chain maille weave. This kit utilizes smooth and twisted jump rings that add texture as well as sparkle and shine to the bracelet. You should be able to make this bracelet in a couple of hours. The kit includes the jump rings, but the clasp is not included. I am sure that you will enjoy making and wearing this beautiful piece of jewelry! This is a beginner project.